The University of Queensland Art Collection is one of Queensland’s most significant public art collections. Developed over 70 years, it features more than 4,000 works of art, comprised predominantly of Australian artists from the colonial period to the present, as well as a nationally significant collection of self-portraits. The Art Collection and the Art Museum’s creative program support and inform each other. The Art Collection speaks to the Art Museum’s distinct place within the University context, and engages with practices and ideas central to research and learning in their many forms. The Art Collection fosters new artistic inquiry, seeking out works of contemporary Australian art that articulate and complicate conditions present at the time of their making. New artwork acquisitions contribute significantly to the Art Museum’s identity as a place for progressive and contemporary creative inquiry. The University warmly welcomes gifts of innovative artwork across a range of media. 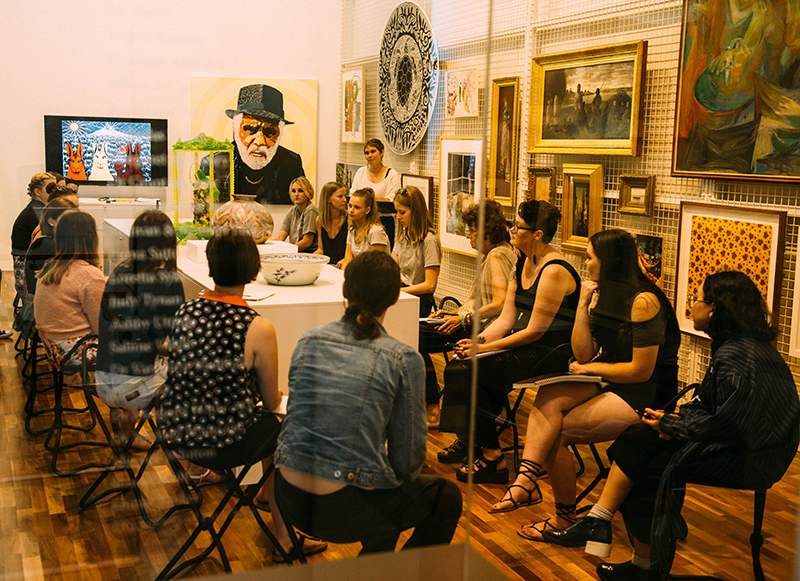 The Alumni Friends of UQ Collection Study Room, a dedicated workroom on the top floor of the Art Museum, is a place where students and researchers can examine requested artworks from the Art Collection under supervision. Collection artworks are also displayed in buildings across the University's campuses. Email us to find out how to access and book the Collection Study Room.